As a solitary kind of child with two brothers and a sister, Susan would spend hours in the arms of a huge oak tree dreaming up ways to make the world a more beautiful and meaningful place. Her animals knew all about it, because she used to have long discussions with them about the plight of the world. Little did she know, she would not have much control over what happened and this was why she stayed on the creative side of things. She realized an artist can stay hopeful, humorous and endlessly seeking the betterment of most situations. Art was a thread that passed through her whole life. Her family members wrote books, poetry, and were musicians. But no one was a visual artist. She had found a way to express herself and this was the place she went when she was sad, happy, confused, thoughtful or just wanted to escape. Each day in her studio she has to make contact in order to stay in touch. The work doesn't always come easily but the intent was consistent. Valuable lessons are learned about time, experimentation, discipline, delighting the senses, accomplishment and self satisfaction. Her interests are many. She writes poetry, children's books, and has two books published. She loves watercolor, printmaking, collage and acrylics. With colored pencil, pen and ink and other medias, she has made an heroic attempt at bringing them all together into one medium. Graduating from the Rhode Island School of Design and PMJC with an AA Degree and a BFA degree in Illustration, Susan had a lifetime association with disabled children and adults. Sports, art programs and Ski and Summer Sports Programs were a therapeutic means to socialize and realize more independence for people with disabilities. In her last full time position, she directed the North Tahoe Art Center in Tahoe City, California. 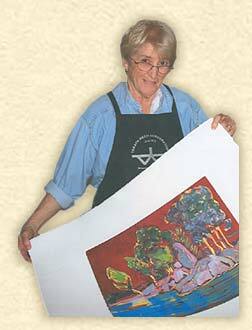 Upon retiring, she moved to Grass Valley, California to pursue her artistic goals and her gardening. She presently has her work in Gallery II, Grass Valley. She is a member of the Society of Children's Writer s and Illustrators and a charter member of The Women's Museum in Washington DC. She also serves as a Docent at the Crocker Museum in Sacramento. Susan D. Michalski © 2005-2016 • Artwork is copyrighted by the artist.